ScrumDo’s work card is really the foundational element of your visual boards, as the boards simply represent the dominant steps of value creating activity. The work, itself, is represented by work cards. 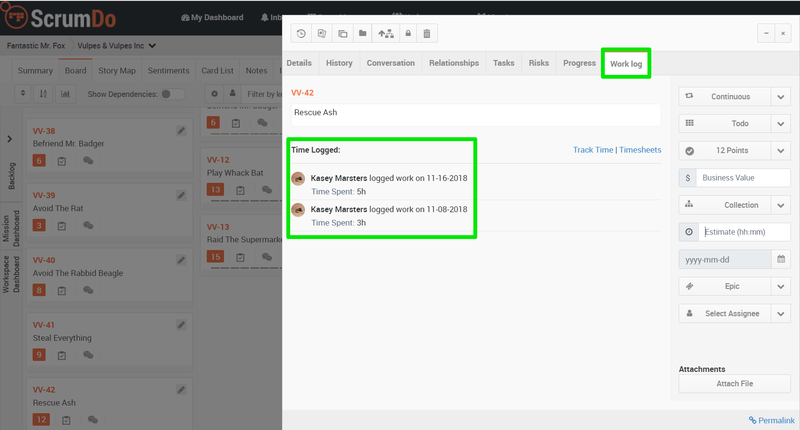 For those customers leveraging portfolio views of their end-to-end delivery streams, the work card interface visualizes the work teams may be doing. Details - In this tab, you capture the elaboration of the card and associated metadata. Here you can move a card to a specific cell, commit it to an iteration, size it with points, specify the business value, organization it into a local collection, estimate it in hours, specify a due date, assign it one more more team members, attach a file and organize it with labels and tag. You also see the 'Aging Detail' of a card. Conversation - this is where you can communicate to one another about collaboration on the work being done, to give feedback, pushback, encouragement, challenge, and praise. Relationships - Now you can add and view Blockers and Dependencies right within the card. Tasks - some work is so interdependent, like a collective body of work being worked on by several people, that it makes more sense to keep them together as subtasks then to break them up into smaller cards. Risks - as in any good endeavor there are always risks be it financial, business, or technical. We have both manually logged risks at any level of your portfolio and system generated risks based upon the parameters that we have set. If something is preventing the progress of a card, you can set a 'blocker here. This will visually indicate that a red border around the card on the board.